Dramm brass shut-o? valve is a professional quality full flow valve. Made of brass for durability. 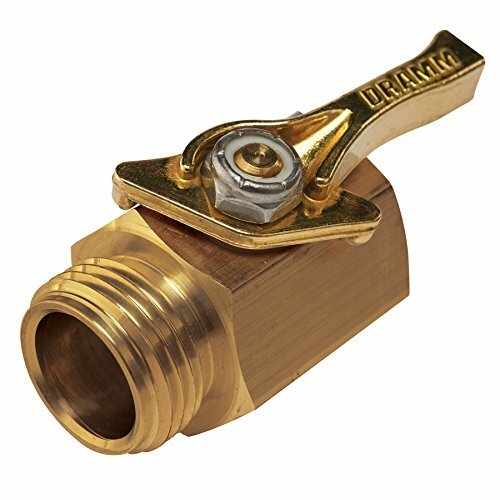 Aluminum shut-off valve is identical to brass valve with lighter weight body made of aluminum. Dramm valves are made in the USA.The 1/2 inch opening in this valve will allow 16 US gallons of flow per minute at 60 PSI. This is more flow than a 5/8 inch garden hose can supply, and as much as a 3/4 inch garden hose can supply. This does makes the valve "full flow". Withstands higher pressure than comparable valves. If you have any questions about this product by Dramm, contact us by completing and submitting the form below. If you are looking for a specif part number, please include it with your message.